The Lowrys never did settle on Gabriola, although they did stay 3-4 days in the Anderson Lodge (now Surf Lodge). Malcolm’s notes from the Gabriola trip inspired his last novel, October Ferry to Gabriola, published posthumously in 1970. It is the only major literary work to feature a Gulf Island. To mark the 70th anniversary of Lowry’s trip to Gabriola, the Gabriola Museum and the Friends of the Library have teamed up with the Gabriola Library, the Ferry Advisory Committee and the Gabriola Arts Council to sponsor a week-long series of events that include a presentation by Malcolm Lowry scholar Sherrill Grace (Oct.1) and performances of Charlotte Cameron’s play October ferries to Gabriola with Drew Staniland and the Twilight Radio Theatre (Oct.2,3). On Oct 04, Drew Staniland will host a screening of the award winning documentary Volcano- An inquiry into the life and death of Malcolm Lowry. For anyone interested in knowing more about Malcolm Lowry, his writing, and his relationship to Gabriola, Phyllis Reeve’s informative article written for the SHALE in 2008 is an excellent summary. 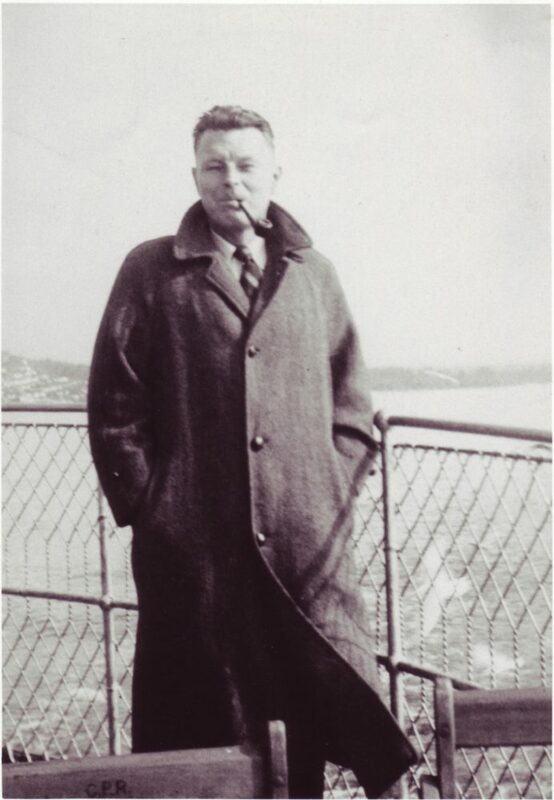 Malcolm Lowry boarded the Gabriola ferry, Atrevida, on October 7, 1946, fretting under the weight of two enormous worries. After ten years of anguished writing and rewriting, he was about to see the first galley proofs of Under the Volcano, which could be one of the great novels of the twentieth or any century. Also, he and his wife Margerie were threatened with eviction from their shack at Dollarton, a small community on the north shore of Burrard Inlet at the mouth of Indian Arm. Like innumerable other visitors to Gabriola, they were house-hunting. They knew of an old house that might still be for sale, and possibly within their means. There was a lot, certainly affordable, but requiring building from scratch with all the implied hassle and delay. The dilemma, so familiar to Islanders, puzzled the Lowrys, as it puzzled Ethan and Jacqueline Llewelyn, characters soon to be created as protagonists of a novel entitled, October Ferry to Gabriola. “Gabriola! Ah, if it should prove the right place… the dreamed-of place…” Jacqueline envisioned, as the ferry edged away from Nanaimo. We know just how she felt. The Lowrys heard about Gabriola from their former landlady in Vancouver, Mrs. J.D. Smith, whose daughter Angela had married a Nanaimo restaurateur, Alfred McKee. The McKees owned a cottage on Gabriola, and could show and tell the wonders of the island. In those days before BC Ferries, Malcolm and Margerie travelled from Vancouver to Victoria by the BC Coast Steamship Service (CPR), then from Victoria to Nanaimo by bus, and finally to Gabriola by a privately run ferry. A taxi took them to Anderson Lodge, now Surf Lodge, about a mile from the McKee cabin. They stayed three or four days, then returned from Nanaimo to Vancouver by the CPR ferry. Sheryl Salloum documented the Gabriola excursion in Malcolm Lowry; Vancouver Days, an invaluable resource for the British Columbia part of the Lowry saga. She included a charming interview with Alfred McKee; and sketch maps of the boat routes, Nanaimo harbour and the downtown area, and of Gabriola, with most points of interest at the North End in the Berry Point/ Taylor Bay area. The only South End site marked is the Roman Catholic Church, known to Islanders as the Log Church. The Lowrys almost certainly did not visit the South End, but one of the chapters in October Ferry recounts an encounter between Ethan and a priest who invited him to visit his “pretty little chapel”. The eviction from Dollarton did not happen. Malcolm and Margerie did not move to Gabriola. They took away with them their usual accumulation of notes on scenes, characters, and vignettes to be worked up into fiction. But Malcolm was slipping hopelessly into the throes of his fatal alcohol addiction. He did not drink while on Gabriola, McKee testified, but such abstinence could not at that point be more than temporary. The last great co-ordinated efforts of his genius went into the corrections of the Volcano proofs. He did turn the notes into a story, then a novel that was supposed to be October Ferry, but he had lost the capacity to sink himself and his work into the layers upon layers of meticulously crafted narrative and metaphor which make Volcano great, and which he intended for the new novel. By the time of his death in 1957, he still had not shown his publishers a draft that they could accept. Margerie did what she could with the manuscript, without changing or polishing more than was absolutely necessary, and in 1970, World Publishing brought out October Ferry to Gabriola, edited by Margerie Lowry. Later editions came from Penguin (with a striking cover appropriately using Frederick Varley’s painting Night Ferry, Vancouver), Viking, and Douglas & McIntyre. Long out-of-print, it turns up occasionally in second-hand bookshops and at Page’s Resort on Gabriola. As a bookseller, I faced two frequent questions. Is it about Gabriola? No, it’s more about coming to Gabriola, about what brings people to the islands, and what they are seeking. The book ends with the ferry nearing the dock; none of the narrative takes place on Gabriola itself. The second question is more difficult. Is it any good? If the questioner does not know Lowry’s works, the question is unanswerable, and, if they are looking for light reading, they should be discouraged from wasting their money and taking away one of the few remaining copies. If they do know Lowry, or if they really want to know, the answer has to be “…yes”. And “…no”. Some passages are wrenchingly beautiful and powerful. Others are as banal as anything in the mystery-romance novels that Margerie sometimes wrote. It remains a work-in-progress. And that brings us to The Voyage that Never Ends. Douglas Day and Gordon Bowker, in their large biographies of Lowry, have little to say about the facts of the Gabriola interlude, although Bowker calls it, “a fateful trip, the beginning of a voyage into a creative image from which Lowry was never able to extricate himself”, and examines the personal anguish which went into the attempted novel. At the end of his life, Lowry was contemplating a huge and complicated connecting of his life’s work, including the novels, into a sequence that would be called The Voyage that Never Ends. For readers as well as writers, the voyage never ends. Some of us on Gabriola decided to take an in-depth look at our Lowry connection and organized A Gabriola Tribute to Malcolm Lowry at the Sandstone Studio at Page’s Resort, on October (of course) 29, 1994. About thirty readers, writers, scholars, and friends of Lowry and/or Gabriola gathered to share thoughts and memorabilia, art, and music, and to take a new look at Our Island as a Creative Image. We published the day’s proceedings as the chapbook: Malcolm Lowry’s October Ferry; a Gabriola Island Tribute. Dr. Patricia Merivale of the University of British Columbia peeled away some of the layers which constitute October Ferry, despite its unfinished state. A spiritual autobiography, somewhere between autobiography and fiction, it is also a travelogue, in which the bus journey from Victoria to Nanaimo becomes an evocation of our West Coast as a pastoral idyll. Beneath the autobiographical modernist surface, she showed us a Gothic quest romance: the bus as the Greyhound of Heaven, the Nanaimo bastion as castle, the Atrevida as Charon’s ferry to the Underworld, the Log Church as the Perilous Chapel. And the Holy Grail is Gabriola itself, “the place-towards-which, the ideal of the heart, the home to which ‘you can’t go home again’, and that is why Ethan can’t get to it within the fiction of this story”. which Salloum identified as the Hotel Plaza, later the Villa Hotel, on Front Street. Lowry’s rich imagination endows the unattractive denizens of this sordid bar with a magic mysticism, a parallel with characters and situations in William Blake’s Visions of the Daughters of Albion. It seemed that Malcolm Lowry had given a symbolic structure not only to his fiction, but also to our reality. As the day progressed, we made another discovery. Our symposium confirmed Malcolm Lowry’s famous capacity for infectious sociability. Poet Earle Birney called him “a great writer and the most lovable of men”. So neighbours, other writers from Birney’s circle, landladies, and chance acquaintances became his friends and, like Hilda and Phil Thomas and Norman Newton, were quick to rescue him from his self-inflicted mishaps.